Investing markets across the board have taken a serious beating in 2018. According to Deutsche Bank, of the 70 asset classes they track, 63, or 90% of them, are in the red for the year. In 2017 only one of the 70 closed in the red. We’ve undergone a massive shift in the investing landscape which bears further investigation. Taking a step back to look at the market and the economy, over the nine years since the depths of the financial crisis bear market in March 2009 the S&P 500 rose 330% through its September peak. During that time GDP averaged an annual growth rate of 2.1%, which is just two-thirds of the average annual GDP growth rate from 1990 through 2007. In comparison, in the nine years between 1990 and 2000, the S&P 500 rose 350% within an economy that grew an average of 3.7% a year. During these two periods the S&P 500 gained roughly the same amount, but in the current period GDP rose at just over half the pace of the 1990 to 2000 period. You can thank all that central bank provided liquidity in the form of various quantitative easing programs primarily provided by the Federal Reserve, the European Central Bank, Bank of Japan and let’s not forget the phenomenal growth in debt in China. As I described on this week’s Cocktail Investing Podcast, you can think of liquidity as water being poured into the global economic pool. As more water flows in, the level of the water, which is akin to the price of assets, rises. However, not all assets rise at the same rate every time. Last time around the increasing levels of liquidity were focused in housing and we saw real estate prices in much of the world rise at record rates. 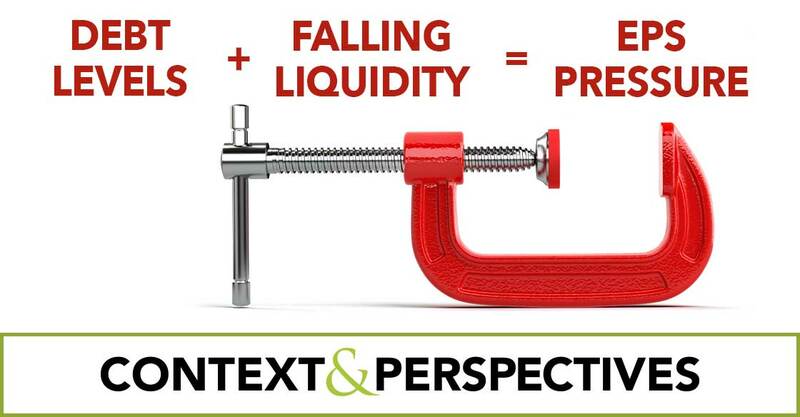 This time around the rising liquidity has been focused in the investing markets. Today the water in that pool is being drained as global liquidity is shrinking at the fastest pace since 2008. The Federal Reserve is reducing liquidity in two ways, one by raising rates and the other by shrinking its balance sheet. When the Federal Reserve raises the Fed Funds rate, the result is higher short-term interest rates. That makes borrowing both more expensive for the borrower and riskier for the lender as the borrower has a higher hurdle to be able to service the debt. The Fed is currently shrinking its balance sheet at an effective annual rate of about $600 billion by not reinvesting those bonds that it holds that mature. This means that when a bond the Fed owns $100 matures, the Fed receives the $100 and does not use it to purchase another bond, which means that $100 stays at the Fed and is effectively removed from the money supply. On November 28, Federal Reserve Chairman calmed the markets with his speech at The Economic Club of New York stating that rates, “remain just below the broad range of estimates of the level that would be neutral for the economy.” The market cheered this shift in tone from his stance in early October when he stated that rates were, “a long way from neutral.” One has to wonder how much the criticism coming out of the White House may have impacted such a change in the outlook for the economy in just 56 days. With most economic data available only on a monthly basis, it seems odd that one month’s worth of data would warrant the material shift that the market now expects. For months the data coming in has been suggesting a slowing economy both in the US and abroad, but we’ve seen nothing dramatic over the past 56 days. The markets are now pricing in one more rate hike in 2018 and only one more in 2019, down from the prior view of up to four next year, which put downward pressure on the US Dollar that lasted all of one day, with the DXY US dollar index back in the green by the following morning. I’d like to point out that the target interest rate range is estimated to be between 2.5% and 3.5%. The Fed’s rate range today is between 2% and 2.25%, so we could be looking at future hikes that would total anywhere from 25 to 125 basis points. Powell also specifically mentioned that “equity market prices are broadly consistent with historical benchmarks such as forward price-to earnings ratios,” which indicates he isn’t worried about the recent stock market weakness. In Asia (ex-Japan) the central banks’ supply of currency and bank reserves have decreased by 7% in real terms since the US Dollar started its recent move up in April. This is the steepest contraction in the monetary base since January and October of 2008 when it contracted by 11%. Overall the inflation-adjusted global monetary base has contracted just five times since 1980 – 1982, 1990, 1998, 2011 and 2006. Every time the contraction either preceded or coincide with global economic slowdown. The question then is, what will be most affected? Global debt has reached a record $247 trillion, 318% debt to GDP – a ratio far above the roughly 200% in 2008. It isn’t just the speculative grade that is struggling. Over 450 investment-grade companies that are not in the top 1% of cash-rich issuers also have cash-to-debt ratios that are quite low, around 21%. Rising rates mean even weaker coverage ratios. The quality of debt is low by historical norms. Moody’s Covenant Quality Indicator has been sitting at the lowest level of classification for the past 18 months, just slightly off its August 2015 record low. An early warning sign — Deutsche Bank 6% coco bond has risen to 10.3%, the highest rate since 2016. Investors expect that Germany’s biggest bank will take serious hits in the next recession. As we look to the holiday shopping season, it isn’t just corporate credit that has our attention. Our Middle-Class Squeeze investing theme is front and center when we see that in the third quarter the delinquency rate on credit card loan balances spiked to 6.2% at smaller banks (the group that excludes the 100 largest). That is well above the peak of 5.9% we saw during the financial crisis. The pace of the decline is also concerning, more than doubling in the past two years from less than 3% to 6.2%. The credit card charge-off rate at these same banks was 7.4% in the third quarter and has now been above 7% for five consecutive quarters. In comparison, during the financial crisis the charge-off rate was above 7% for only four consecutive quarters. You read that right, the charge-off rate has been worse in the past five quarters than in the debts of the financial crisis. But hold on a minute, overall credit card and other revolving consumer credit was just $1 trillion in the third quarter, which is right about where it was at its prior peak a decade ago despite a population that has grown by about 20 million people. Doesn’t that mean that consumer debt isn’t a concern? If we look at the credit card delinquency rates for the top 100 banks, things do in fact look pretty good for the consumer, sitting at just 2.5%, which is well below the over 6.5% rate in the depths of the financial crisis. The message here is that while the banks overall are not in danger here from credit card debt, what we are seeing is that those consumers who are the most vulnerable — those with weaker credit history — are already getting into trouble with their credit cards at a time when we are being told the economy is stronger than ever. What happens to them and to the smaller banks that serve them when times inevitably get tougher? Overall retail sales in October, when adjusted for inflation, rose just 2%, at the lowest end of the post-financial crisis range but e-commerce continues to be extremely strong, reflecting our Digital Lifestyleinvestment theme. Total retail sales not adjusted for inflation rose 4.6%, but eCommerce accounted for the bulk of that, rising 14.5% from a year ago. Falling liquidity plus upcoming debt refinancing will be a headwind to earnings. The bottom line is we are in the midst of major shifts in market dynamics. The outsized performance of the stock market relative to the weak rate of economic growth was fueled by liquidity injections courtesy of many of the world’s central banks. Now that liquidity is draining out of the global economy at a meaningful rate at a time when the US is engaging in a level of deficit spending unheard of outside of a recession or war, so we are seeing a major increase in Treasury bond issuance. That means less liquidity as we see a significant increase in the supply of new Treasury bonds. The overall US corporate balance sheet is quite weak, particularly when we remove the handful of large cash holders. With over one-third of the outstanding corporate bonds floating rate and one-quarter of all corporate bonds rolling over the in next three years, rising interest rate expenses will be adding to the rising margin pressures from the tightest labor market in decades. In other words, a headwind to EPS generation that investors and the multiples they assign to the stock market will have to contend with. In the coming months we will be watching for any changes in fiscal policy coming out of DC to gauge the level of Treasury bond issuance. We will be watching the dynamics in corporate credit as many will need to favor shoring up their balance sheets over dividends or buybacks. For investors, this is a time to ensure that not only are the companies in which you have invested benefiting from the types of long-term tailwinds we focus on with our investing themes, but to also review the financial health of the companies in your portfolio. There will be a price to pay for the past corporate debt extravaganza.